Twenty-five years ago this week England's new outside-half gathered a kick under his own posts in the first minute of his international debut and launched an audacious counter-attack. Not much later, and at the other end of the field, he was landing his first points for England with a drop-goal. The drop-goal was a portent of much that was to come, most memorably in a Rugby World Cup quarter-final against holders Australia a decade later. The counter-attack was not. Rob Andrew was rarely to do anything as uninhibited again in an England career that was to last for 12 years, generating 71 caps and 396 points, including 21 drop-goals, or in a subsequent coaching and management trajectory that has culminated in his present role as the Rugby Football Union's director of elite rugby. He was to become to England rugby what spin bowler John Emburey was to its cricket in the 1980s - an artist who recast himself as a functionary, repressing his more creative tendencies to serve the priorities of his team. Yet it was no particular surprise, on that cold January afternoon playing against Romania at Twickenham, that Andrew reacted as he did in the opening moments. It was, after all, exactly what he had been doing for the previous three years at Cambridge, culminating in a 32-6 hammering of Oxford in the previous month's Varsity match. 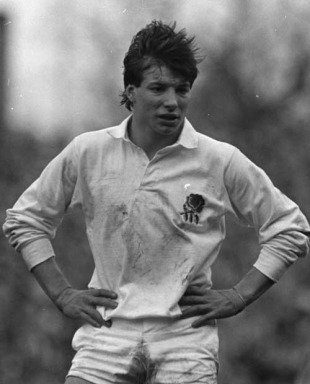 This was the last period in which sizeable numbers of players graduated from Varsity match to international rugby - and even then the Cambridge team that also included such luminaries as future Scottish international and ESPNscrum columnist Iain Morrison, England wing-to-be Mark Bailey (now a professor at Cambridge) and Gavin Hastings was seen as something of a throwback in both quality and style. It was little wonder that acerbic Daily Telegraph writer John Reason compared the Romania game to 'the University match…played a month late by teams in the wrong shirts'. Four of England's six debutants were Cambridge blues. This might look like putting out a weaker team against less-rated opposition, but was not so. The entire XV, with the exception of injured fullback Nick Stringer, would be retained for the opening Five Nations clash with France. What it did represent was one of those lurches in selection in which England once specialised. England had named five debutants to face Australia at Twickenham two months earlier. The 19-3 defeat by an initially lightly-regarded touring team had begun to look much better since as the Wallabies played their way with mounting brilliance to their first ever touring Grand Slam, but that did not stop the England selectors discarding all five newcomers, including Andrew's Oxford rival Stuart Barnes, and retaining only four of their starting XV for the visit of the Romanians. All four Cambridge debutants were backs. Andrew and centre Kevin Simms had played in the recent Varsity match while wing Simon Smith had won his final blue a year earlier. Scrum-half Richard Harding had had a much longer wait for recognition after playing in the 1973 and 1974 Varsity matches. The other two newcomers, in something of a caricature of English rugby's class structures, were northern lock forwards. The Yorkshireman John Orwin had been on the fringes for some time, and would captain England three years later, but nobody knew much about his second-row partner except that he had an unusual name and had been plucked out of Lancashire's lower reaches. Getting onto the bench, and making a second-half appearance as a replacement, for the North against Australia had been an achievement in itself. But Wade Dooley would be around for the best part of a decade, becoming the first English lock to top 50 caps. It was also a big day for the Romanians, their first Test against England. They were perhaps unlucky that progressive recognition through the 1980s - they were rated as full cap opponents along with Argentina from 1981 - came a little after a peak that had led a French writer to hail them as 'world champions of defence'. The French, after losing four times in five visits to Bucharest between 1974 and 1982, were beating them again while Italy and the Soviet Union were offering sustained challenges to their long primacy among Europe's developing rugby nations. A year later the sporting effects of the economic and social decay that would lead in 1989 to the overthrow of the Ceacescu dictatorship - a revolution whose martyrs included Florica Murariu, who played on the flank at Twickenham - were evident when they were savaged 60-0 by Ireland in Dublin. Even so Romania were still good enough in 1988 to come to Cardiff and win 15-9, a result that sped Wales captain Jonathan Davies's departure to rugby league. And in 1985, they were capable of giving England a game, albeit a limited and uninspiring one that put the brakes on England's early forward ascendancy, and keeping themselves in contention with regular penalties from veteran outside-half Dumitru Alexandru. England's performance was a foretaste of Andrew's career. The early dash evaporated, but England did win, by 22-15. It perhaps did not help that they lost two players to injury - the only reason for which replacements were permitted in those days, with Barnes replacing Stringer at fullback after 35 minutes and yet another recent Cambridge back, Huw Davies, coming on for Simms in the second-half. The sole try was scored with some panache by Smith, a lively attacker who was never quite to fulfil his early potential, during the second-half and a crowd of around 30,000 departed disappointed by what Rothman's Rugby Yearbook reckoned 'an eminently forgettable match'. And yet it launched two great careers and stands as an occasion comfortably within living memory which yet seems to have been in another age. Nowhere has changed more than Twickenham itself, entirely transformed in the years since. On that January afternoon in 1985 it was still possible to stand - as I did - on an uncovered terrace at Twickenham and experience temperatures which have had a contemporary echo over the last few weeks.